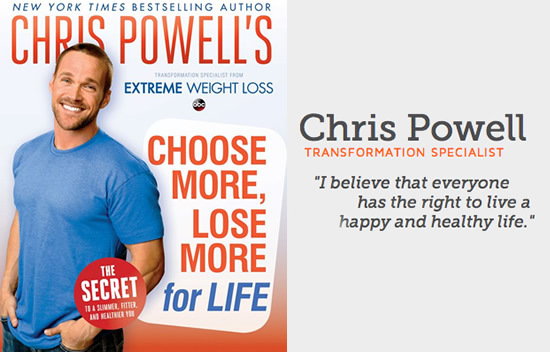 Chris Powell is known for helping people lose weight on the television program “Extreme Makeover: Weight Loss Edition”. In Choose More Lose More for Life, he offers readers a flexible plan for transformation that anyone can follow. It is based on his successful carb-cycling method that boosts your metabolism by alternating between low and high carb days. Chris Powell first introduced the carb-cycling approach to weight loss in his book “Choose to Lose: The 7-Day Carb Cycle Solution“. If you are not familiar with this method he explains the concept in this new book, Choose More, Lose More and gives you all the information you need. The basic idea is that switching between low and high carb days tricks your metabolism and enhances fat-burning. This helps you lose weight faster and avoids the need to follow a strict low carb diet. Chris Powell realizes that everyone is unique and more options lead to a greater chance of success. So he has provided four plans that allow you to cycle your carbohydrates in a slightly different way. This way you can choose the plan that best suits your goals and lifestyle. This is for people who are just getting started and might lack the willpower to stick with carb cycling. It is designed for dieters who don’t want to feel deprived or give up their favorite foods. On this plan you are allowed to cheat every other day but you will still consume half your usual amount of calories. You will notice instant results but weight loss won’t be as fast as on the other plans. This is the original carb cycle that Powell introduced in “Choose to Lose”. It is the simplest plan – but not the easiest – however it will reward you with fast weight loss. If you are ready for a moderate challenge but don’t want anything too complicated you will probably enjoy this plan. If you want to reach your weight loss goals as quickly as possible choose this plan that maximizes fat loss. Metabolism boosting days are strategically scheduled to prime your body to burn fat more efficiently. There are also more fat-burning days, which gives you faster results than any of the other plans. If you are very physically active this plan can help you lose weight and boost your performance. A high level of exercise means that you burn a lot of calories and need a higher intake of carbs to fuel your activity. However you can still cycle your carbs to lose weight and avoid gaining new fat. Chicken, salmon, pork tenderloin, lean beef, egg whites, tofu, cheddar cheese, corn tortillas, brown rice, quinoa, black beans, sweet potato, lettuce, spinach, tomato, green beans, red pepper, avocado, pineapple, melons, almond butter, olive oil, balsamic vinegar, herbs and spices. The book has twenty workouts called “9-Minute Missions” that provide maximum results with minimum time. They include simple calisthenic exercises that can be performed at home without any special equipment. There are also muscle-moving workouts called “Shredders” because they promote peak levels of fat burning. These exercises are less intense but they take longer to do – from 10 to sixty minutes depending on your fitness level. You should perform one set of both of these workouts five days a week. Chris Powell’s Choose More, Lose More for Life retails at $24.99. Offers four different ways to manage the carbs in your diet. Includes 35 recipes for main meals and snacks with high and low carb variations. Addresses the psychological factors essential for successful weight loss. Includes a month of different workouts, which can reduce the likelihood of exercise boredom. Requires monitoring your intake of calories and carbohydrates. Some readers may find the carb cycling principle complex at first. Vegetarian recipe options are limited. Choose More Lose More promises fast weight loss by cycling your intake of carbohydrates where you alternate between low and high carb days. It provides four different plans so that you can choose the option that works best for your goals and lifestyle. Success will ultimately depend on the motivation and perseverance of the dieter.